Enjoy a fun day at Sandy Beach as you build elaborate sandcastles. You can work peacefully on your sandcastle or enter into a battle with invading crabs in Crab Battle mode. 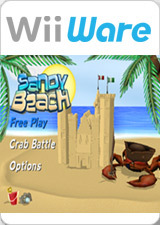 Players will strategically build their sandcastle and defend it with cannons against an army of destructive crabs. After successfully defending your sandcastle, discover beach treasures and additional cannons with your metal detector to customize your castle even more. The graph below charts the compatibility with Sandy Beach since Dolphin's 2.0 release, listing revisions only where a compatibility change occurred. This page was last edited on 15 January 2018, at 02:45.